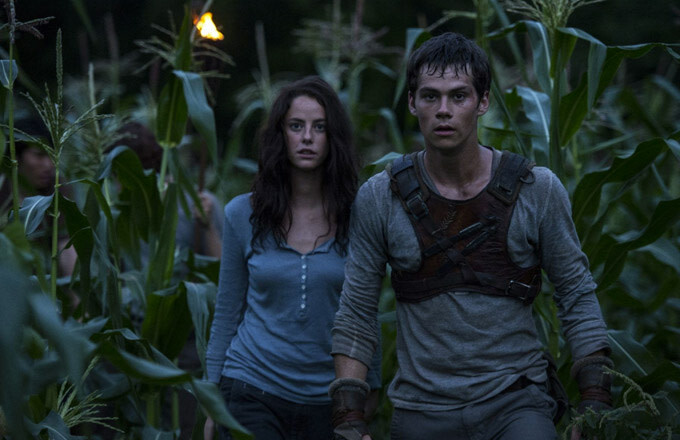 When it comes to the recent rash of YA adaptations, The Maze Runner is a singularly frustrating experience. It doesn’t just squander its abundant potential to break away from the stagnant tropes that have calcified its genre, it ultimately reveals that it had never had any hope or intention of doing otherwise. If The Maze Runner begins as an urgent and refreshingly focused addition to the canon of dystopian teen survival stories, it ends by exemplifying the worst of its kind (in part because it doesn’t really end at all). Based on a popular series of novels by James Dashner, The Maze Runner opens in media res, which immediately makes it different and more exciting than almost every other dystopian tween saga. A generically handsome kid (Teen Wolf star Dylan O’Brien) wakes up in an industrial elevator, with no memory of who or where he is (though he soon remembers that his name is Thomas). When the lift slams into the top of its tracks, the boy finds himself surrounded by a posse of other young men in the middle of an enclosed field. Finally, a movie that empowers teen boys! 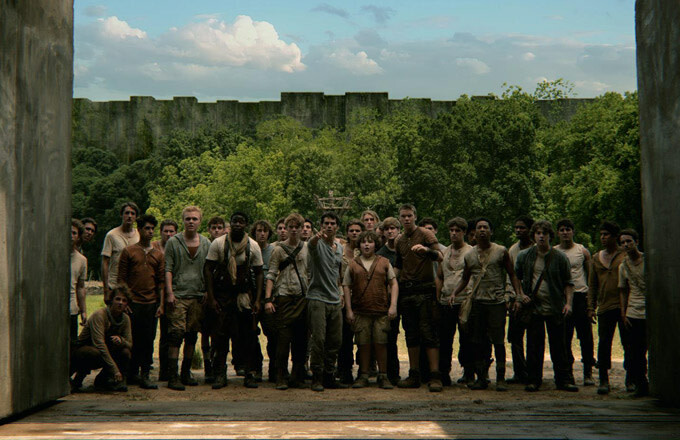 Each of them has come to this place in the same way, and each of them has learned, as Thomas soon will, that there isn’t anywhere else to go. The field, however verdant and serene it might appear, is in the center of a deadly labyrinth that separates the three dozen boys in the community from the outside world, whatever that might be. The fastest and strongest among them spend their days running the maze, mapping it in the hopes of an eventual escape, but progress is slow, and if one of these “Runners” doesn’t make it back to base by midnight, they’re never heard from again. But Thomas isn’t just another fresh face—he’s a YA hero. He is the one. Like Katniss and The Giver and Ms. Divergent (that was her name, right? ), Thomas is so noble, curious, and stubborn that there isn’t time for him to be anything else—he’s not a character, he’s three adjectives with a pretty face. Within 72 hours of his arrival in this world that’s part Lost and part Lord of the Flies, Thomas has become the best Runner in town, his actions and discoveries upsetting the fragile balance of the village elders (such as they are). Newt (Thomas Brodie-Sangster, the smitten kid from Love, Actually) values Thomas’ ambition, while Gally (Will Poulter) isn’t quite as interested in shaking the status quo, and may even envision the field as a permanent home for he and his friends. The first half of the film is as bogged down by world-building as every other YA adaptation, but the story’s centralized location, combined with the palpable menace of the maze that constricts it, makes that process much more ominously exciting than usual. Thomas’ amnesia, of course, is also a convenient way to unfurl the premise through the eyes of its protagonist, and the 45 minutes that this (ironically slow) child spends responding to every new detail with a shocked “What the hell?” is much more fun to watch than the usual exposition dumps. The maze itself, an enormous gauntlet of moving parts that resembles the ruins of a fallen city, is far more impressive in scale than it is in structure. If the film were a video game (and it often feels like one), it could use better level designers, a shortcoming that perhaps explains why first-time director Wes Ball prefers to allude to the labyrinth than explore it first-hand. As a result, the maze is reduced to little more than a hyper-elaborate wall, keeping the kids in, and the Grievers—deadly spider-like creatures that patrol the maze on enormous mechanized legs—out. To Ball’s credit, the boys’ first encounters with the Grievers are genuinely harrowing, and imbued with a sense of danger that recent films of this type have sacrificed for the sake of their young audiences. Fortunately, the business between the boys is fun, if not particularly nuanced. The rest of the cast is quick to compensate for the the Thomas character&apos;s slack-jawed banality. Poulter and Brodie-Sangster share an adorable “man of science vs. man of faith” dynamic, and Blake Cooper is aces as the community’s chubby court jester. There’s a palpable solidarity fostered between these lost boys. That refreshing spirit of togetherness, however delicate, helps sell the idea that their village isn’t a trap so much as an Eden, Thomas the nascent Christ figure who pushes them into their grisly New Testament (a reading that strengthens with every plot twist). The only character who The Maze Runner fails to the same degree that it eventually fails its audience is Teresa (Kaya Scodelario), the lone girl who’s dropped into the mix about halfway through. Her muted appearance, and the film’s insistence that she remain on the bench, is the first sign that Ball’s marching orders were to set up a franchise, and make sure that absolutely nothing in this first installment pays off in a satisfying way. And if his feature debut is any indication, Ball might be the Spielberg of not paying things off. It’s not just that the film’s shamelessly cynical final moments prime viewers for a sequel at the expense of telling a satisfying story (the last line is “Now begins Phase 2”), but that the answers it does provide make you wish that it hadn’t bothered to ask such compelling questions in the first place. The novel had to be the first of a series, the film has to be the first of a franchise; the way that properties like The Maze Runner are shaped by the economics of their time, forced to be epic and episodic in equal measure, suggests that movies aren’t losing to television—they’re becoming television. The dramatic questions raised by Thomas’ circumstance are provocative enough to serve as the backbone for a rich and rather classically told sci-fi saga, but the speed with which the story unravels suggests that Gally may be right—maybe it’s wise not to risk a good thing in the hope of something better. David Ehrlich is the Editor-at-Large of Little White Lies and a profoundly important freelance film writer. His interests include movies about movies, the New York Rangers, and recycling the same terrible personal bio until he dies. He tweets here.